Siri and Google Now aren't the only digital personal assistants out there any more. 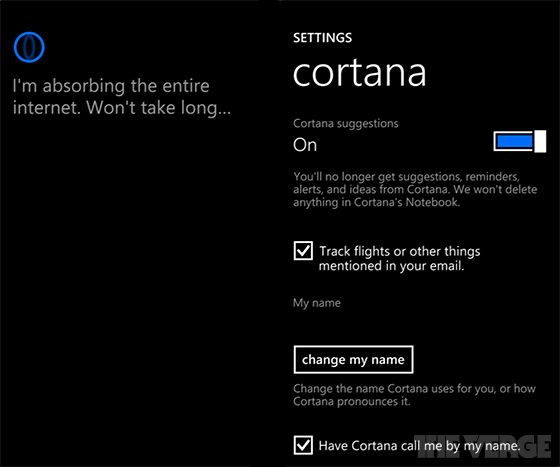 We’ve heard rumors about Microsoft’s Cortana assistant for Windows Mobile 8.1, now we can see what she looks like. The Cortana assistant for Windows Mobile 8.1 does not look like the AI construct from the Halo games, but we have our first look at what it will look like thanks to the above leaked photo from The Verge. For video game nerds the cell phone war just got interesting. Let’s face it, as a general rule the Apple iPhone is a superior piece of engineering. Of course, Samsung has been on the heels of Apple all along and is often the preferred device for many a smartphone user. The Apple personal assistant “Siri” came out with promises that couldn’t be kept - I mean, the hype by Apple suggested Siri would be intelligent and capable of discerning some level of nuance, instead it’s just a voice activated internet search program - but it’s still a useful and novel tool for hands free searching. Now with the upcoming release of Windows Mobile 8.1 a new digital personal assistant is on the horizon to rival Siri and Google Now. It’s time to wake up Chief, Cortana is calling. Created by Bungie, Halo is one of the most popular games in history. It made first person shooters viable and incredible on consoles. A core piece of the game is the AI construct Cortana, who is the conscience of the game as she rides along with Master Chief. She is the heart and soul of Halo, and is the one redeeming quality in what is essentially a balls to the wall space war that is designed as a series of 5-10 minute battles. I have to admit that nothing that has been done outside of the iPhone has ever made me so jealous. Even when other companies do something better or first, as is the case with the watch phones out now, I simply don’t care because overall my iPhone is the best piece of portable gadgetry I could hope for. The problem is that this is a Windows phone, and I’m just not all that impressed with what Microsoft is doing these days. Perhaps a switch to Android would be tolerable, but Cortana will only be available on devices running Windows Mobile 8.1.